The Royal Ballet's new Swan Lake will be broadcast live in cinemas across the world, and relayed to BP Big Screens in the UK, on 12 June 2018. Liam Scarlett's production is the Company's first new staging in 30 years, and the broadcast promises to be a major event in the arts this summer. Tchaikovsky's score for Swan Lake is some of ballet's most recognizable music: ‘From that first note on the oboe you are immediately transported into this beautiful, tragic fairytale,’ explains choreographer Liam Scarlett. The Royal Ballet's new production builds on this tradition: Scarlett has created an entirely new Act IV, based on the musical running order that was also used by Former Director of The Royal Ballet Frederick Ashton. Scarlett's production sees the dancers in the corps de ballet wearing tutus rather than long skirts. The production is another chance to experience the partnership between Liam Scarlett and highly-esteemed designer John Macfarlane, which has blossomed since their first collaboration on Asphodel Meadows in 2010. The two reunited in 2016 to create Frankenstein. The live cinema relay is a showcase for the Company, who dazzle in full royal finery at the palace, and in delicate feathered tutus as flocks of swans. Marianela Nuñez dances the roles of swan princess Odette and black swan Odile; while Vadim Muntagirov dances the role of Prince Siegfried. We've rounded-up audience and press reviews from opening night and we'd love to hear from you before, during intervals and after the live cinema relay, so share your thoughts via Twitter and Instagram using #ROHswanlake. If you're watching the performance via BP Big Screen in the UK, share your interval picnic pics with the same hashtag for a chance to win a collection of Royal Opera House DVD/Blu-Rays. Swan Lake will be relayed live to cinemas around the world on 12 June 2018. Find your nearest cinema and sign up to our mailing list. The production is sponsored by Van Cleef & Arpels and is staged with Generous philanthropic support from The Monument Trust, Ricki Gail and Robert Conway, Mrs Aline Foriel-Destezet, Jette Parker, Celia Blakey, Sarah and Lloyd Dorfman, Doug and Ceri King, the Swan Lake Production Syndicate, The American Friends of Covent Garden and The Royal Opera House Endowment Fund. I'm actually going to see Swan Lake live this week (first time in the actual Royal Opera House - excited! ), but I would likely go to the cinema if not. I really enjoy ballet and opera and the cinema screenings are a pretty decent way of getting a fix outside of when the touring opera and ballet companies coming to the area - a lot of the loss of being there in the same room as the performers is made up with the impact of watching it on a big screen. However, I am disappointed that there are no BP Screens near where I live (I'm in Manchester). It'd be really nice to see ballet and opera in the open, and to get friends who might not be interested in coughing up the money for a ticket to see some of the art forms. Are there any plans to expand the outdoor screenings, particularly in the North West/Manchester area? We are certainly open to expanding our sites and we have approached 22 venues in the north; unfortunately we haven't been able to secure any partnerships for the BP Big Screens this time around. It's very important to us to be able to share opera and ballet with as many people as possible! Sorry to disappoint you this time around. To bad there are no cinema screenings in Poland. Would love to see this new production of Swan Lake. I would have to travel to Germany to catch the nearest live cinema relay; but I’m a ballet dancer myself and busy with rehearsals. This promises to be one of the most moving, exquisite ballet productions and performances of Swan Lake EVER! Take plenty of Kleenex is my recommendation! I can't wait to see it at the Prado Cinema in Sitges, Catalonia! - This darkening world is in dire need of such Beauty, still surviving, thanks be to God, Liam Scarlett and to the ROH!!! I can find a whole list of cinemas but they do not seem to be screening Swan Lake. I believe Hebden Bridge and Lancaster might be the nearest to here. All I want to know for sure is that there is nothing in Vue cinemas in Accrington, Burnley, Blackburn, Preston etc. I thoroughly enjoyed the 3 operas shown at BP Big Screen Brighton, at the Marina Village last year. I’ve never been to a ballet before so I was excited about watching Swan Lake, but Brighton doesn’t seem to be listed for that. Please may you confirm if this is correct? The only ROH production listed for Brighton is Don Giovanni. I’m not too concerned about La Bohème as I’m off to see it at ROH in July. We're afraid Swan Lake won't be relayed to our Brighton BP Big Screen. It will however be in local cinemas. You haven't disappointed anyone Mel. In fact the Royal Ballet do extremely well in sharing these productions around the world, taking the Lions share of Arts promotions. I will be watching at the underground giant IMAX screen at Rheged and really looking forward. Agreed. This is strange and sad. Why no NYC showings? April, there are no less than 8 venues listed for showing Swan Lake in the New York area and some recorded showings. Click on the Venues link on Royal Ballet website, select USA and you will find them listed. Is there any chance that that Opus will release this recording in a DVD? No details have yet been confirmed or announced, though if this changes, it'll be announced via our website and social media channels. Vlad, it looks like all the showings across the USA are recorded. Be assured that it will be worth waiting for. It may be a commercial decision based on the large time difference. It would need to be shown late morning to mid day, when most people are at work. That would be something if the Royal Ballet shut down Wall Street. Are there any showings in South Africa or Zimbabwe ? A huge following of ballet in both countries. I'm Julia and do you know if we have a bp in the U.S.
Our BP Big Screens are only available in the UK, I'm afraid. Getting excited here on the beach in Exmouth, Devon. Good luck with the production. So disappointed in Millennium Square, Bristol not to see this. How often do we have a perfect summer's evening to be outside as we did this evening. What happened! I even took leave to get there sms watch it. Thank you for getting in touch with us. We are sorry to hear that you could not experience Swan Lake on the BP Big Screen in Bristol. We are currently investigating the cause of the issue with the staff at Millennium Square in the hope of resolving this for the BP Big Screens performance of La bohème on the 26th June. I watched the live stream at the Picture House cinema in Exeter. The lighting of the production appeared to be terrible! It was so bad that you could barely make out the dancers in Act 4 - in fact Rothbart just vanished into the murk. I imagine that was a problem with the stream, rather than the actual lighting design, buy I'd be grateful for your comments. Thank you for getting in touch with us about this. We are very sorry to hear that you experienced problems with the lighting during the later stages of the Swan Lake screening. There were no issues with the transmission leaving the ROH that evening, so we will contact the cinema concerned in the hope of preventing such issues for future screenings. Totally disappointed with the viewing at the vue cinema in Leicester last night. I was so looking forward to seeing swan lake as we were unable to get tickets in London. The sound was missing from the beginning and went off very regularly during the first section. We were unable to have sound to connect after the intermission and left in disgust. I and my daughter were so looking forward to the evening. Looking on the bright side, the costumes and scenery were amazing. Thank you for getting in touch with us. We are very sorry to hear that you experienced problems with the sound during the Swan Lake screening on Tuesday evening. There were no issues with the feed leaving the ROH that evening, so we will follow up with the cinema in question in the hope of resolving this for future screenings. beginning, I now that dance could be much more diffifult than opera singing. Our physical body has to be always prepared for balley. My number one will awleys stay by OPERA . BIG HONOR and THAK YOU TO MY teacher,mamma Madam Grace Bumbry. Wonderful evening,perfect dancing by principals and soloists equally. However apart from Nunez and Muntagirov we had no idea who the other dancers were as the Phoenix cinema in East Finchley did not provide a castlist (not the first time) Would it be possible to find the names of all the excellent dancers in a complete list? Is it Swan Lake the ballet is better then Carman opera? Oh yes. I love to see ballet's dance and the music is wonderful I can't wait for DVD of " Swan Lake" but buy " Carman" on DVD? NO!!!!! I went to see our Royal Ballet perform their new version of ‘Swan Lake’ - transmitted ‘live’ to cinemas across Britain and the rest of Europe. I have seen many versions of ‘Swan Lake’ but this amazing version wipes the floor with ALL of them. Brought right into the 21st Century, this amazing ballet has much to see, and savour, and ‘digest’ right from the Prologue which explains the curse; its purpose (to seize ultimate power); and the only way out of the horrific predicament (a masterstroke) before we are swept away on a roller-coaster journey of entrapment, terror, trust, hope, love, and insidious malicious deception, treachery, and retribution as we confront law, truth, and justice of jurisprudence - and evil is once again destroyed - but never eradicated. The majesty, grace, and stamina of the amazing dancers, married to the grandeur and potency of the sets and the incredible poetic stagecraft - reminiscent of Hollywood blockbusters - were breathtaking and spellbinding as we watched a sumptuous palace seamlessly transform into a moonlit lake- scene right before our eyes – so spectacular – all made possible by the genius of the costume and set designer John Macfarlane and the lighting designer David Finn - each bringing their own unique skill-set to create amazing ‘colour-scapes’ using clever ‘forced perspective’ rotating set elements married to low-key lighting to change the mood as the harp roulade announced something truly ‘magical’ was about to take place – and it does not get more magical as the palace transforms into a lake and regal royalty transform into a garland of swans (representing memories and thoughts - good and bad - black swans representing dark memories and sinister thoughts and emotions; white swans representing pure thoughts and emotions, and dreams and aspirations; and ‘cygnets’ representing fresh emotions filled with love, joy, and hope). At the conclusion of Act 2 we see Rothbart in that deadly deceitful pas de trois say to the prince "Do you love this woman?" (Odille displays fright at this juncture). When the prince replies "With all of my heart". Rothbart then asks "And will you take this woman in marriage?" When the prince says 'yes', Rothbart ensnares the prince by asking "Do you SWEAR you love this woman?" When the prince raises his two fingers high into the air to say 'I swear' (and our own ‘memories’ instantly transport us back to the lake (Earths all-seeing eye) when the prince swears he will be loyal) the denouement takes place - but - there is still HOPE. At the beginning of Act 4 we see the forlorn Odette having an 'argument of juxtaposition' with herself (something women do a lot – and we see ‘Topal’ do in ‘Fiddler on the roof’) - questioning what should she do. It is a fantastic pas de action where we see her say – “It was ‘love at first sight’ (so wonderful to see that mime (touching both eyes with both forefingers) revived and revitalised) and my prince has betrayed me” - and the 'swans' (her conscience) say Yes - but he has been duped” - and then we see the corps de ballet and Odette 'tussle' with the situation as they say “ remember the happy memories” (black swans exiting so only happy memories remain); “remember the love he showed without prejudice”; “remember he has always been loyal” - and then - with a brave heart - the prince turns up (not like some who would simply text and say 'we are done’). He is full of woe - he has a lot of explaining to do - and as the final deeply moving pas de deux unfolds (thank you Marianela and Vadim x), the forlorn prince expresses deep sorrow in his apology - and now the Swan Queen - a woman with purity in her heart - must make the ultimate decision - to 'be' or not 'to be'? We then see that with 'oneness' and 'togetherness' they have the combined strength to kill the raptor (bird of prey) that is Rothbart - and they DO - but although Odette forgives the prince his folly – caused by the deceit of others what has Odette decided? To take arms against a sea of troubles – or crush the torment and doubt and put an end to her misery - knowing that should she drown herself the prince will suffer anguish for the rest of his life. PS: Dear Royal Ballet, be like feature-film makers and release this spectacular ballet on 4K and BluRay ASAP – a years wait is torture for us all when all you have to do is sub-contract it to Sony – who will release it on your behalf in a matter of weeks. Thank you. Brilliant production and performance, marred by terrible sound at Vue Cinema Oxford. At the start there was no sound at all. Then the introductions by D'Arcy and Ore were almost inaudible against the background audience noise. The music, however, was frequently deafening. Who is responsible for maintaining the sound at an appropriate level? Thank you for getting in touch with us. 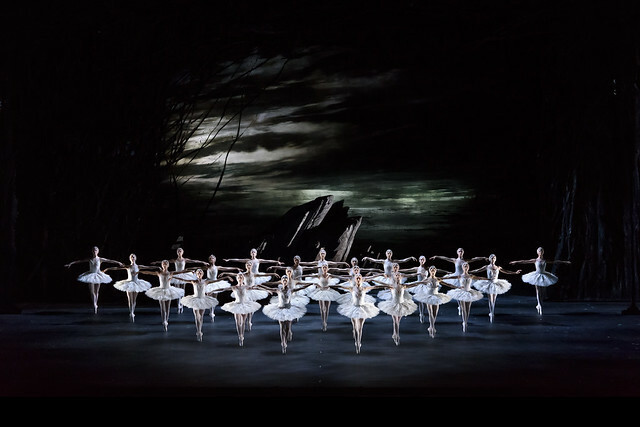 We are sorry to hear that you experienced sound issues during the screening of Swan Lake on Tuesday evening. There were no problems with the transmission leaving the ROH that evening. Further to this, our sound department systematically test audio levels within real cinema conditions prior to every production. We will follow up with the cinema in question in the hope of resolving such problems for future screenings. Because I could not buy any ticket, I went to cinema. It was "the" Swan Lake performance and "the" Swan Lake production for me. Thank you very very much of course to wonderful Marianela and Vadim, great Mr. Scarlett and Mr. Macfarlane, but also to all of the people who worked for the production, it was "the dream has come true"-Swan Lake for me. I've waited for a long long time, since my childhood, to experience such a Swan Lake. So, I do would like to ask you to provide the cast list of 12th June online,so that we can know all of the name of the dancers&staff, and can print it out for keeping.... there were no list at the cinema. We can always get a list, the white one, at the ROH before the performance, free of charge, which is actually a jewel for me, most important thing for the precious memory! Thank you! When I hear about people experiencing difficulties with the sound and the light, I realise how fortunate we were at the Odeon, Sheffield, where the whole ballet came over so well, and gave us an evening to remember.. Superb Swan Lake ! Sadly cannot access the Digital proramme . Tried several times , entered promo code , nothing . Any help gratefully received . Sorry about this, it's certainly nothing to do with what you're doing! We've had a few technical issues with our digital programmes and the Swan Lake digital programme won't be available during the run of the performance, unfortunately. Sorry for the frustration. I’m not able to obtain the free programme. When will this problem be resolved please? Thanks. Sorry for the frustrating experience. Unfortunately, we've had a few technical issues with our digital programmes and the Swan Lake digital programme isn't available on the site. We're hoping to resolve this issue soon but unfortunately it won't be available during the run of Swan Lake. Is it possible to purchase the full programme of Swan Lake? - I saw the performance on 12 June at my local cinema and thought it was fantastic - the cast, the scenery, the costumes - everything was superb! Will there be a DVD of this new production and if so when can we buy it?! many thanks. We are happy to report that there is a DVD and Blu-ray release of this production of Swan Lake scheduled for May 2019, although this date is subject to change. Unfortunately, there are currently no cinemas in Turkey screening 'Swan Lake'. I went to the UCI-Cinema in Dessau/Germany on 12-Jun-2018 and the performance was simply great. I have never seen anything more spectaclular than this one. Is there any chance of getting a DVD of this performance? Absolutely beautiful performance! We are sending huge BRAVO from Prague in the Czech Republic! This rendition was one of the best I've ever seen. Unfortunately, I have not seen the last few minutes due to "logistical problems". That's why I hope this performance will be available for purchase on DVD. Thank you very much for the wonderful experience! My granddaughter and I had a wonderful evening in the cinema in Holland. Thank you so much. Will there be an Encore screening of Swan Lake? We were away on 12 June and although I've seen 2 casts at Covent Garden, I missed Nunea and Muntagirov. Hello i can't find where to download the free digital program of swan lake. I have my code and all but since the creening i am looking for it without success... It was a magical production! The best i have seen so far. Sorry for the frustrating experience. Unfortunately we are having ongoing issues with our digital programmes and the Swan Lake programme isn't available. We are working to fix the issue but it make be a slightly longer fix than we expected. Apart from Nunez and Muntagirov could you please advise the names of some of the other dancers. ie Pas de trois, little swans etc The screening has just been scheduled in Australia.